CAPTION: Grand River Technical School hosted a mock accident docudrama twice on Friday (once in the morning and once in the afternoon) on the west side of the school. 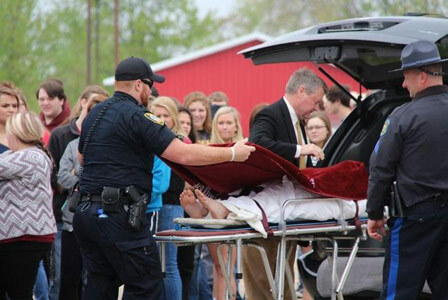 This mock accident showed students the dangers of distracted and / or impaired driving. In the afternoon session, the scenario was that a drunk driver struck another vehicle. The passenger of the drunk driver was pronounced dead at the scene and the driver that was struck was LifeFlighted. Several entities participated in the docudrama, including Chillicothe Emergency Services, Missouri Highway Patrol, and LifeFlight Eagle. Driving is a big responsibility. There are many dangers that drivers face while traveling from place to place without being distracted or impaired. However, when drivers are texting, eating, messing with the radio or impaired in any way while driving, the risks increase for not only themselves, but their passengers, pedestrians crossing the street and other drivers on the road as well. 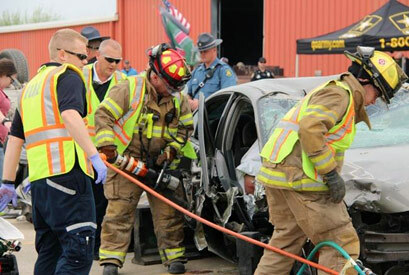 The Grand River Technical School's chapter of SkillsUSA hosted a mock accident docudrama recently to stress the dangers of driving while impaired or distracted. The event was hosted on the west side of the school and included information / demonstrations provided by Chillicothe Emergency Services, Chillicothe Police Department, Missouri Highway Patrol-Troop H, U.S. Army, Life Flight Eagle, Missouri Safe and Sober, St. Lukes / Hedrick Medical Center Trauma team and MoDOT. "The purpose of this mock accident is to raise awareness to students and let them know that distracted driving is dangerous," Grand River Technical School Computer Networking instructor, Brandon Dennis, said. "You can tell them, tell them, and tell them, but if you show them, it makes more of an impact. With the ambulance and the fire truck being there, it becomes very real." GRTS teacher, Vicky Duckworth, said GRTS has hosted the mock accident annually for most of the last eight years, and she has been the coordinator for the past five years. "The event is usually hosted during a time of year that witnesses numerous prom and graduation related events," Duckworth said. "The event is open to all GRTS students, freshman through seniors from 16 sending schools, and includes the adult students as well. Plans are to include other grade levels as space and time allows." GRTS performed the mock accident twice on Friday: once in the morning and once in the afternoon. In the afternoon mock crash scenario, there were two vehicles involved. One vehicle was driven by a drunk driver. The drunk driver had a passenger in her car that was pronounced dead at the scene by Livingston County Coroner Scott Lindley. The vehicle she struck had one passenger. That passenger was severely injured and had to be LifeFlighted. GRTS assistant director, Adam Wolf, said the mock accident emphasizes the importance of the "Don't drink and drive" and "Don't text and drive" messages. "I think it helps drive the message home for students," Wolf said. "The accident looks real and, hopefully, it helps open students' eyes. If it saves just one life, it's worth it." Duckworth said, that the ultimate goal for the program is to get young people, and older people, to think about the consequences of their actions and to help them understand how their choices can impact not only themselves but those around them. Both driving while distracted and driving while impaired are serious issues. According to Centers for Disease Control and Prevention, every day, 28 people in the United States die in motor vehicle crashes that involve an alcohol-impaired driver (amounting to one death every 53 minutes), and the annual cost of alcohol-related crashes totals more than $44 billion. Also according to disease control, in 2014, 9,967 people were killed in alcohol-impaired driving crashes, accounting for nearly one-third (31 percent) of all traffic-related deaths in the United States. According to distraction.gov, in 2014, 3,179 people were killed, and 431,000 were injured in motor vehicle crashes involving distracted drivers, and 10 percent of all drivers 15 to 19 years old involved in fatal crashes were reported as distracted at the time of the crashes. This age group has the largest proportion of drivers who were distracted at the time of the crashes. Distracted driving is any activity that could divert a person's attention away from the primary task of driving. All distractions endanger driver, passenger, and bystander safety. These types of distractions include: Texting, using a cell phone or smartphone, eating and drinking, talking to passengers, grooming, reading (including maps), using a navigation system, watching a video, adjusting a radio, etc. However, according to distraction.gov, because text messaging requires visual, manual, and cognitive attention from the driver, it is by far the most alarming distraction. 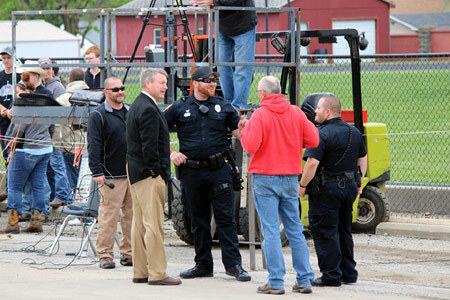 The Chillicothe Elks Lodge helped make the the SkillsUSA Mock Accident Docudrama a success! 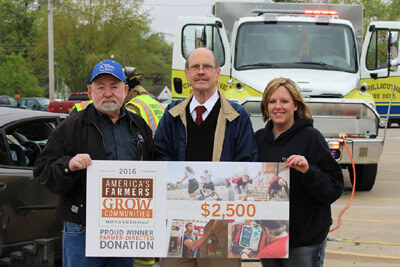 Dan Graham (left) chose the Lodge as the recipient of the grant money he was awarded. "Traffic safety experts classify distractions into three main types: Manual, visual and cognitive," Chillicothe Police Department Detective Jon Maples said. Manual distractions are those where one moves his or her hands away from the task of controlling the vehicle (example: reaching for a soda), visual distractions are those where one focuses his or her eyes away from the road (example: dropping the soda), and a cognitive distraction is when ones mind wanders away from the task of driving (example: wondering how to replace the clothes that the soda just ruined). "Many objects and activities both inside and outside the vehicle can pose visual, manual, and mental distractions," Maples said. "We (the CPD) are big on traffic control because driving can be dangerous, especially when adding distractions..." Detective Maples said that although an increasing number of states are placing restrictions on cell phone usage, Missouri has no law regarding the use of cell phones while driving. "The state does, however, ban texting for 21 years of age or younger," he said. "Distracted driving is very risky and is known to lead to fatal car crashes... We (the CPD) do enforce the state texting law because it can save lives." This page updated by BK Web Works 05/12/2016.